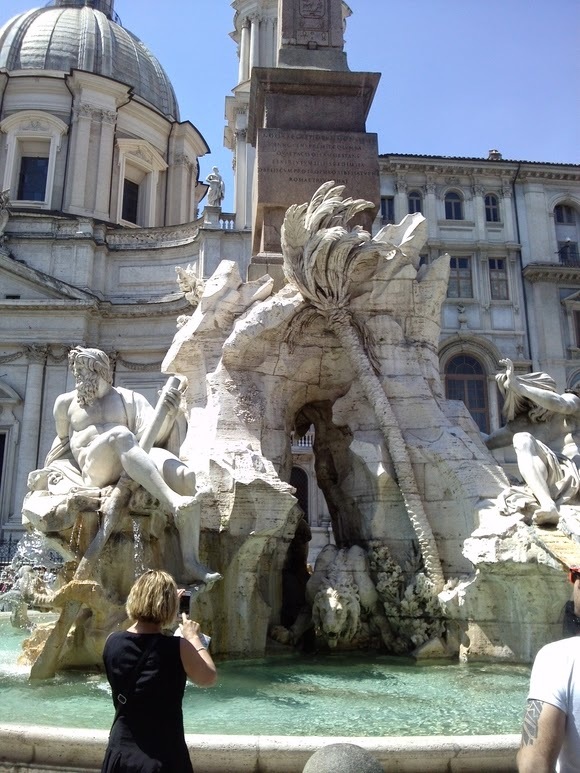 Our first stop on Thursday was the famous Trevi Fountain, you know, the one from La Dolce Vita in which Anita Ekberg strolls into the water as Marcello Mastroianni pursues her. Just as with the Colosseum, the Trevi Fountain took me completely by surprise – bigger and more beautiful than I imagined. Next came the Pantheon. 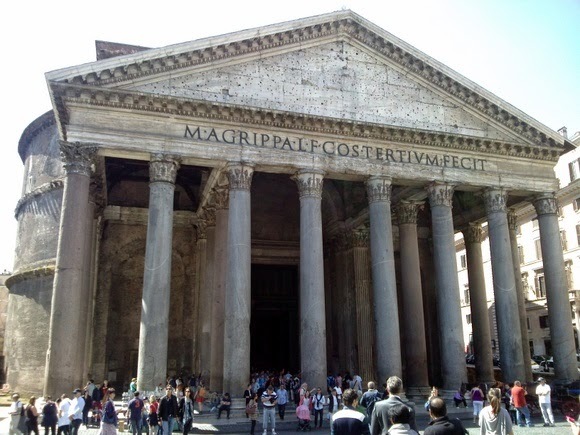 Dating back to the year 126, the Pantheon used to be the first (pagan) church in Rome. 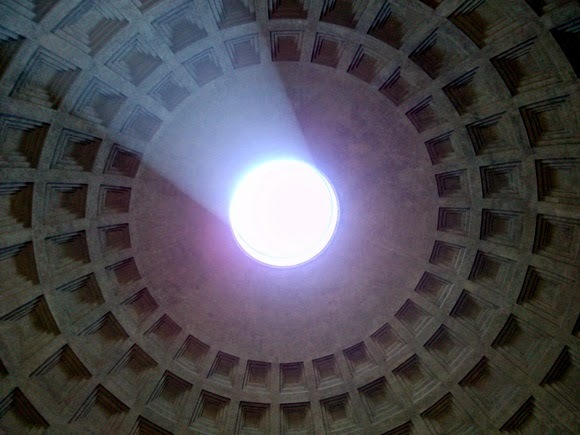 The huge hole, or oculus, at the top lit the entire building. Just outside of the Pantheon was the Caffè Tazza d'Oro. 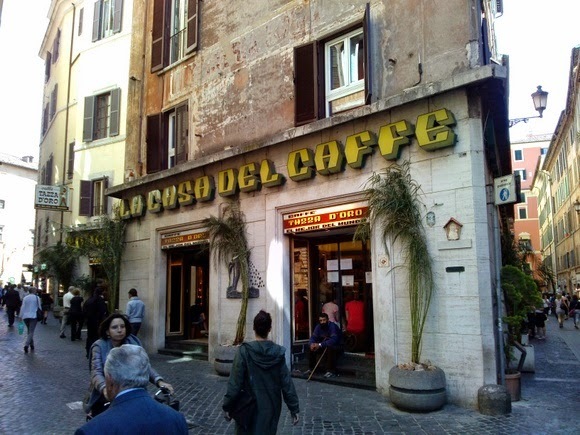 Rumor has it they serve the best coffee in Rome. I'm not a coffee drinker, so I just opted for a café latte. And did I mention how ridiculously cheap the drinks are at Caffè Tazza d'Oro? 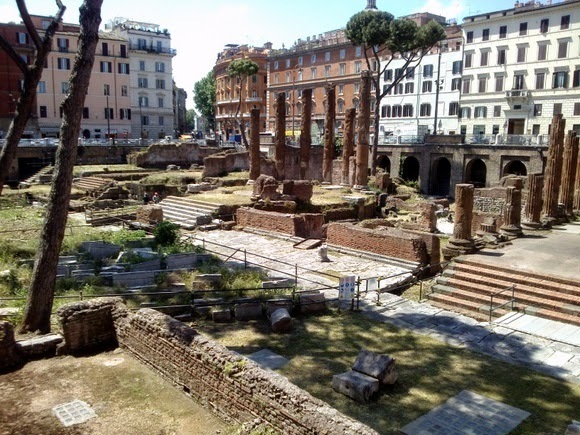 We then went on to the famous Torre Argentina Cat Sanctuary where the cats have a bunch of ancient ruins for themselves and are being fed and cared for. I did an entire series of photos on the Torre Argentina Cat Sanctuary on Traveling Cats if you're interested. This is also where you can find more information on the Torre Argentina foster program. 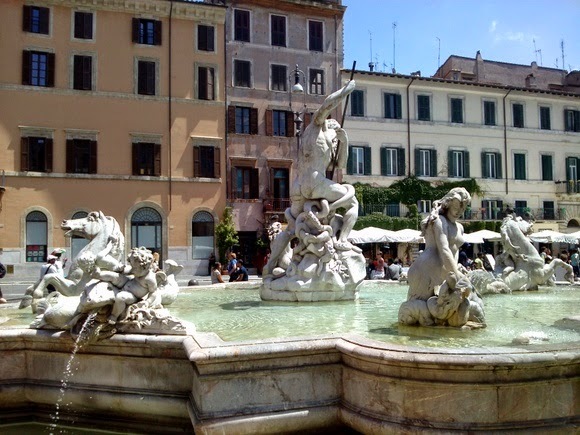 Next stop: Piazza Navona, with its many restaurants and beautiful fountains. We didn't eat at the piazza, though, but opted for the Pizzeria Osteria del Pegno on Vicolo di Montevecchio. Their homemade ricotta and spinach ravioli topped with orange sauce was mouthwatering. 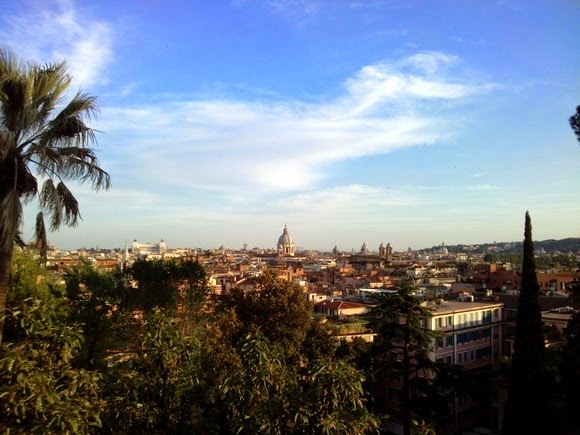 In the late afternoon, we went for a stroll in the park Villa Borghese and found a lovely view overlooking the city. We went back to our hotel passing the Spanish Steps. With its 136 steps it's the widest in Europe. The atmosphere was lively. Too tired to look for a place to eat, we set off for the Lebanese restaurant Mandaloun Caffè in the Spagna area of Rome which we chose only because it was next to our hotel, but it turned out to be some of the best Lebanese food we ever had. Part three of my trip to Rome will follow in a couple of days. Have a lovely weekend, everyone! Ah-h-h...lovely. I travel in my dreams...My daughter arrived home last night from a 2 week sprint in Paris and Berlin, I live through my children...Enjoy!! Gorgeous! I love the cat sanctuary. Some days I think I live in one the way my two bacl kitties rule the roost. A beautiful story of your trip to Rome! Seeing your pictures brings back a lot of memories. Thanks for sharing! Great photos! 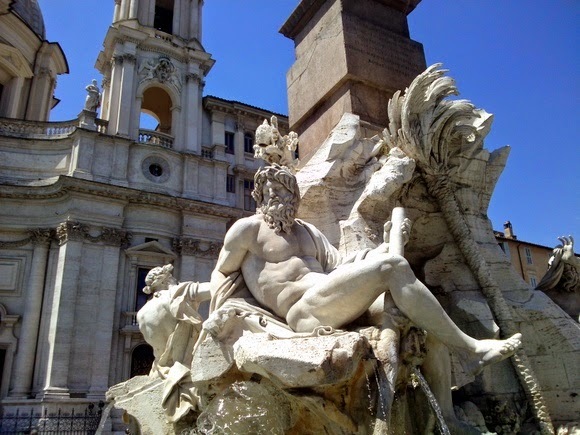 I would like to go back and spend a bit longer in Rome, as we saw many of these sights but rather hurriedly because we were on an excursion from a cruise. The cat sanctuary sounds interesting! Wow! Just wow! These pictures are amazing. Such fantastic pictures! I'd love to go to Rome one of these days. Amazing photos! Love them all! I really love the Pagan Church! Breath taking ceiling! 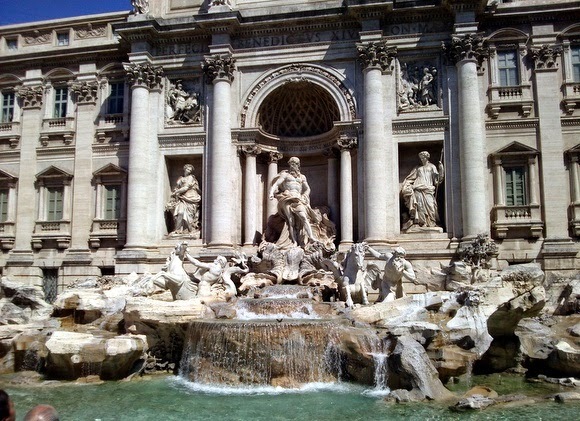 I've heard of the Trevi Fountain all my life, but seeing it in that picture makes me realize just how amazing it is! Oh wow. I love the rich details and history. These photos are so amazing, I can't imagine how much I'd gawk if I were there. So amazing. It's like stepping into the past. I so very much want to visit Rome! !